The Rural Rambler: Annual Ginseng Seed Sale Underway - Get Yours Before It's Gone! Annual Ginseng Seed Sale Underway - Get Yours Before It's Gone! Rural Action's Sustainable Forestry Department has received a substantial delivery of ginseng seeds for it's annual sale, and though growing your own ginseng is sustainable, this sale is not! Quantities are limited, contact Tanner Filyaw to find out how you can purchase seeds to grow your own ancient cure-all and enjoy the financial and health benefits of farming this incredible natural remedy. For information on ginseng cultivation and pricing see the figures provided below and for information on availability contact Rural Action today! Orders will be accepted through early Fall. 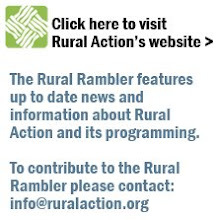 To place an order, call Tanner at 740-767-4938 or email tanner@ruralaction.org. Payment can be made by cash, check, or credit card (Visa or Mastercard). Payment must be received prior to processing and shipment of your order. All orders will require an additional $11 shipping fee for next day delivery. Pick up also available. Orders will be shipped in time for fall planting. We will notify you via email or phone on the day of shipping so you will know when to expect your package. Sorry no P.O. Box deliveries. 20 or more pounds $65/lb. $70/lb. The harvesting of American ginseng root has been an important historical, economic and cultural tradition for many Ohio families dating back for generations. American ginseng was one of Ohio’s first export crops, harvested in great quantities by early settlers, hunters, trappers, and land surveyors during the late 1700’s, well before Ohio had even been granted statehood. As a result of the economic potential the ginseng trade flourished and wild populations began to diminish. Entrepreneurs seized this opportunity and began experimenting with commercially cultivating roots in order to maximize profits, while decreasing their foraging costs. Today, American ginseng remains a highly desired commodity, and is still exported in large quantities to China, Japan, Korea, and Southeast Asia. Though diminished, a tradition of wild harvesting has continued over the last 200 + years and as a result wild populations of American ginseng have become very scarce, often sparsely scattered over hundreds of acres. In response to this shortage, modern harvesters and landowners have taken a page from history and are again practicing “wild-simulated” cultivation, using modern agricultural concepts to create a more sustainable and profitable alternative to wild harvesting than ever before.. Rural Action’s Sustainable Forestry Program has been working with landowners and growers for the last 10 years to further the practice of wild-simulated cultivation, which consists of simply mimicking the natural seeding and growing conditions of wild ginseng plants, producing a root that is virtually indistinguishable from a truly wild root. With this method, seeds are purchased from a commercial/cultivated source and planted on the grower’s own property, eliminating potentially wasted time and effort often associated with the search for wild root. This sustainable approach protects declining wild ginseng populations while simultaneously increasing yields and profit potential. Since 1999 Rural Action’s Sustainable Forestry Program has been promoting wild-simulated ginseng cultivation as a viable forest income strategy providing hundreds of growers and forest landowners with start-up assistance, consultation, and seeds for planting. Over the years Rural Action Forestry’s Annual Planting Stock Program has distributed approximately 1,050 lbs. of American ginseng seed to growers in Ohio and throughout the Appalachian region. After harvest, this seed could potentially generate $1 million dollars in revenue for growers as well as state and regional economies. There is still time for anyone to participate in the 2009 Planting Stock Program and write your own chapter in American Ginseng’s history. To find out more about wild-simulated ginseng cultivation, including purchasing ginseng seeds for fall planting, contact Tanner Filyaw at 740-767-4938, or by email at tanner@ruralaction.org for your free consultation.